Katelyn Tuohy's day started off relatively normal. The 16-year-old hopped into the car with her family and headed toward the local deli, where she she was going to pick up a birthday cake for her father, Patrick, on his 45th birthday. Instead, out came Sydney McLaughlin and Tuohy's own specialty cake. 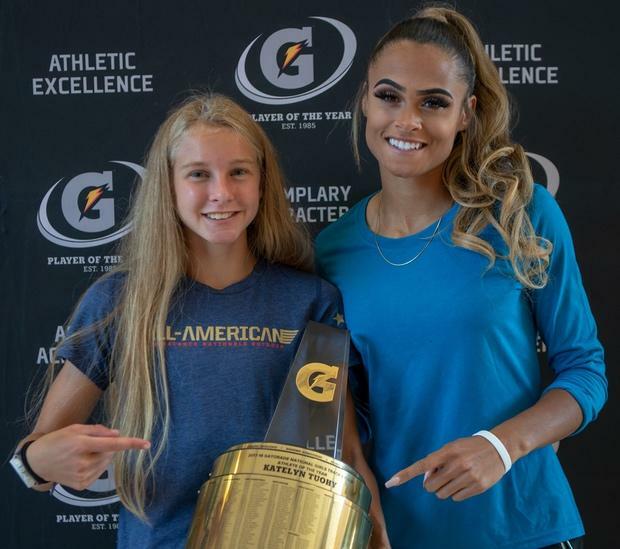 Just a week after being named the winner of the MileSplit50, the 5-foot-4 distance stud became the only athlete in Gatorade's 33-year awards history on Tuesday to win national honors in two sports after receiving its National Girls Track and Field Athlete of the Year award for the spring season. "I'm speechless," Tuohy later said. Only two female athletes in the history of Gatorade's awards program have won more than one national athlete of the year award in track, and their names were Sydney McLaughlin and Marion Jones. The latter won three straight awards from 1991-1993. McLaughlin, meanwhile, received her second straight honor in 2017 before closing out her high school career as one of the sport's new emerging faces--she was an Olympian at 16, after all. So it was fitting that McLaughlin was there for the honor. In some ways, it was a figurative passing of the torch: Last year's face of high school track giving way to the star of tomorrow. "For her to get it again and for me to come back full circle, it's really exciting," McLaughlin said. "I'm excited to see where her future goes." McLaughlin is just a year removed from her own trophy and just a few weeks off her decision to turn professional. This spring alone, the University of Kentucky freshman set numerous records and won her first and only NCAA Championship at the 400 meter hurdles. McLaughlin said Tuesday she's going to continue taking online classes with Kentucky, though she's still planning out her workflow and schedule in the next weeks and months -- i.e. she's not sure where she's moving yet, she's officially done with her season and she's currently having negotiations with shoe companies about potential contracts. She handed the New York native, who now owns five national titles across cross country and track and field, her national trophy Tuesday morning. "I wasn't excepting that," Tuohy said. "She's not a distance runner, but I've looked up to her over the years. She's from New Jersey, so she lives around the corner from me. I saw her run the 300 at a meet and she broke a record, so I always knew she was really good. Seeing her in person, it means so much." Tuohy has had an epic sophomore track and field season, maybe the most epic ever. Here were her accomplishments: Two national records, one national title, two state championships, four US No. 1 times, one sophomore class record and five personal bests. She's just two weeks removed herself from setting a record that many thought was impossible. Tuohy reset the national record in the girls 1-mile race with in winning New Balance Nationals Outdoor in 4:33.87. And that, she said, was her proudest moment of 2018. "To get my speed back and to cut down to the mile and cut down to the national record was cool," she said. If there was any race over the course of Tuohy's magical season that went off script, it was in New York during the indoor season. Tuohy finished fourth at the Millrose Games high school girls mile at The Armory. But Tuohy said that result wasn't what motivated her this spring. "My real motivation was that it was my last race and I wanted to cap off my sophomore year pretty loudly and strong," she said. "If you were to ask me her favorite race, I wouldn't pick," said Brian Diglio, who coaches Tuohy in cross country and works in tandem with Kyle Murphy during the spring track season. "I would tell you about her workouts. That's more impressive to me than any of the races she's competed in." Among other prestigious accomplishments, Tuohy also set a national record in the 3200m at the Loucks Game, clocking a 9:47.88, and set a sophomore class record in the 3K (9:09.71) at her outdoor state championships. She also went a US No. 1 time in the 1500m of 4:14.45. In the winter, she set a national indoor record in the 5K in 15:37.12. Tuohy said one of her hopes in 2019 is to potentially race in a collegiate or professional field. "Next year if I can get in more competitive races, whether it's professional or collegiate, I want to be able to test myself with runners who are faster than me," she said. "I've been running a lot of races on my own, the 5K and mile. I was by myself. I think, if I had someone with me. It could push me to the next level." Tuohy shut down the idea that she wouldn't run for North Rockland, though. "I definitely want to stay with my team and everything," she said. "But if I had to, be unattached for one race. I wouldn't be opposed." While Gatorade does not award a national winner over the indoor season, Tuohy may have earned that honor had it been available. She set a national record in the 5K, set sophomore class records in the 1500m and the 3K, and won a national title in the 2-mile run at New Balance Nationals Indoor. Previously, Tuohy won Gatorade's National Cross Country Athlete of the Year in the fall after winning Nike Cross Nationals and breaking a handful of records across New York.